Successfully Added Quadband Music Shake Phone - Dual SIM with TV Function to your Shopping Cart. 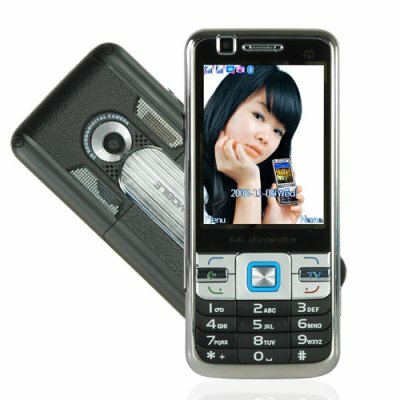 Quadband Music Shake Phone - Dual SIM mobile phone with TV. Slim profile quadband GSM unlocked dual SIM cellphone with a 2.6 inch screen for worldwide use. This fully unlocked digital mobilephone has plenty of character and appeal with its accessibility and rich features. With a funky quad-band (850MHz, 900MHz, 1800MHz, 1900MHz) GSM/GPRS design, it is ready for worldwide use on any network. This cell phone features two SIM card slots (with Dual SIM with Dual Standby) allowing you to have two active numbers within the same mobile for maximum convenience for those with a busy lifestyle. Why settle for a phone that can only give you access to one of your SIM's at a time? This phone gives you twice the SIM functionality for the price of a single phone. Listen to your favorite music in style with this cellphone. Dance to the grooves and the beats with this mobile music system! Shake the phone to change tracks, it's that simple! Make music an interactive experience with this playful phone. This feature-rich model also comes packed with plenty of easy-to-use productivity tools and multimedia features, including a camera and video recorder. The main functions available include a modern phonebook and contact manager for those who are always busy, an easy to use keypad to give you silky smooth access to the great onboard features, and Bluetooth with A2DP + AVRCP for excellent wireless connectivity in this modern age. This phone has something for everyone and would make an ideal gift with its broad appeal and quirky charm. This fun mobile phone is in stock now and available for single sample or bulk orders. Order your stock now and don't forget to check our mobile phone accessories section to see our selection of Bluetooth speakers and earpieces. MicroSD/TransFlash memory card slot. Allows expansion and swapping of cards. on 2009-07-23 21:09:19 Good telephone! I recomanded four everyone! Good working in Roumania! on 2009-07-02 13:11:54 Otimo produto gosteimuito.Quero receber em casa. very good phone for very good price I bought it to resell but loved it too much to let it go..shipping was fast and easy all the way to Jamaica.